Donkeys are notoriously stubborn. Or, as one donkey psychologist opined, a donkey's natural reaction is to freeze when he senses danger, and then wait to assess the situation. So they're not really stubborn, you know, just careful. I guess that makes me feel better about donkeys. Doesn't it? Indeed, someone does challenge the disciples as they are getting the donkey. "What are you doing, untying that donkey? He isn't yours!" "The Lord needs him," they say, and then go ahead unhindered, untying the colt and bringing it to Jesus. Jesus mounts this young donkey, and rides him into the Holy City, fulfilling prophecy, and setting off a sequence of events that end not in a gruesome crucifixion on Friday, but in a glorious resurrection early the following Sunday morning. I am struck by the words the disciples are given to say should their assignment be questioned: "The Lord needs it." First, the disciples need to calm the owners, then the young donkey itself. "The Lord needs it." Those words are enough. Sometimes I've wondered if the Lord really needs me. What difference do I make to the Lord, among all the billions on the earth? And the philosopher in me wonders how a truly omnipotent God could ever need anything or anybody? But I quiet these thoughts. The gospel writers tell us that Jesus needs a particular donkey this day, one who is unridden, unbroken. 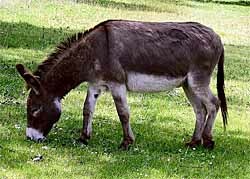 God's purposes forever set this particular donkey apart as the one the Lord uses. Maybe, later, the owners put up a sign on their fence: "Jesus of Nazareth rode on this very donkey!" Why does Jesus choose this particular donkey on this particular day? We don't really know. But he does. His instructions are, tell anyone who asks: "The Lord needs it." And the donkey is made instantly available to the Lord, no matter what his owner has planned for it. Mi donkey es su donkey. When I was nine years old, I became acutely aware that I hadn't given my life to Christ. That was my issue. Not, do I believe? But, will I give myself to God entirely, unreservedly, however he wants to use me? For weeks I struggled with the realization that the Lord wanted me to give myself to him, and I was resisting. Kind of like a young, fearful, stubborn donkey. And then came the day when Jesus overcame my fears and I walked forward to pray with the pastor, my resistance over. The Lord needs me. Oh, that's boastful, you say. Yes, but also true. He called for me, and now I'm available whenever and wherever he wants to use me. I've been like that donkey. Unbroken, at first. Skittish. Prancing a bit. But as I become comfortable with the Master riding on me, I begin to enjoy it. I look forward to it. To be needed, desired, wanted by Jesus is an amazing privilege, you know. My dear friend, Jesus needs you. He's picked you out. Now he is calling you for his purposes. Are you willing? Are the words, "The Lord needs it," enough for you? Or will you be stubborn, selfish and fearful so that you freeze, refusing to move. I encourage you to relax and trust him. Jesus knows how to calm you, how to train you, how to use you in ways that will ever mark your life with glory. Relax, and let him take your rope. Then follow on. It'll be okay. The story of Palm Sunday begins with a wonderful word: "The Lord needs it," met with instant permission. Yes, my friend, the Lord needs you! Say, "Yes."